Church Street Library worked in partnership with the award-winning Improbable Theatre to create the Impro For Elders project. The project involved a free weekly drama group, attended by older residents of the Church Street area. During ten weekly rehearsal sessions a well-assorted group of energetic and sharply witted ladies and gentlemen worked towards two performances, created from scratch, based on the practice of Improvisation. 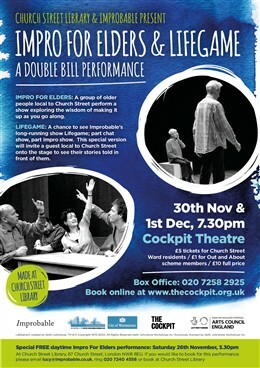 It was then performed in public over two evenings at the local theatre The Cockpit as part of a double bill which also included Improbable’s show Lifegame.